Riot Police on Wednesday crushed a demonstration by the Morgan Tsvangirai led Movement for Democratic Change in the central business district of Harare calling for electoral reforms from the Zimbabwe Electoral Commission (ZEC). Business temporarily came to a standstill in the CBD as riot police engaged in running battles with scores of opposition youths who had gathered to register their displeasure against ZEC’s demands for proof of residence during voter registration and many other grievances. 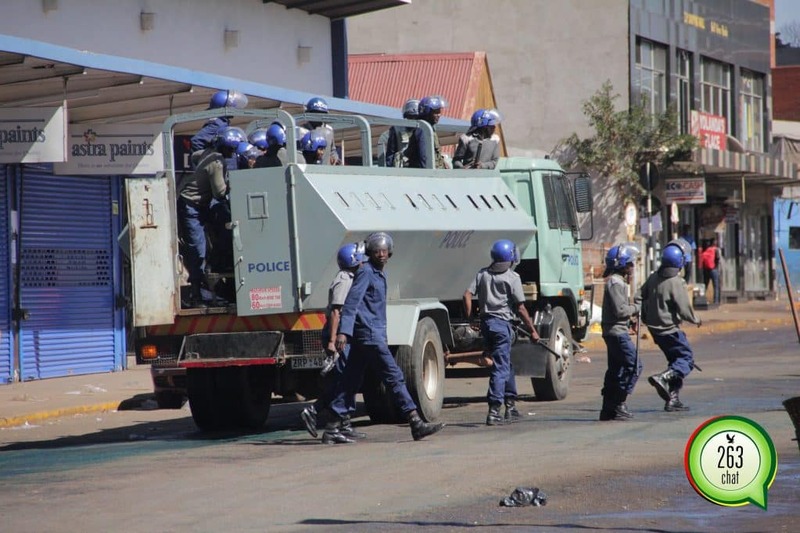 The riot police who literally took over the CBD descended on protesters with teargas, water cannon and batons sticks allegedly arresting upto six MDC-T youths who were part of the demonstrators. This is not the first time that the police have exhibited its heavy handedness on the opposition party as last year during the #MyZimbabwe launch; police fired teargas, brutally assaulting and arresting about 60 MDC-T youths and vendors in the CBD. Meanwhile, MDC-T Youth Assembly has called for the Police Commissioner General, Augustine Chihuri’s resignation for the manner in which police handled the protest. “We condemn the police action today where heavily armed police officers brutally crushed our peaceful demonstration in Harare CBD and in the process also harassed journalists covering our demonstration. “We witnessed the cruel spraying and water cannoning of the Aljazeera Correspondent which we wish to condemn in the strongest of terms. “We hereby call for the immediate resignation of Police Boss who continues to preside over a grouping of people who have no respect for the constitution of the land. We will in due course petition the relevant bodies and the courts of the land to ensure that we practice our demand,” said MDC-T youth Secretary General, Lovemore Chinoputsa. He said “it is sad to note that under the watch of Chihuri, the Zimbabwe Republic Police has continued to act as agents of Satan by continuously harassing Zimbabweans to the levels that would make even the notorious NAZI Special Forces green with envy. He vowed that his party will continue with the demonstrations until their demands have been met.